Sportsbetting AG is an online sportsbook which has a poker room, racebook, casino games, and mobile sports betting operation. Though Sportsbetting.ag Poker is owned by Revitalized Limited, the poker room is run on the Revolution Gaming Network created by Lock Poker. Other software used on the site includes Cake Gaming software and Betsoft tech. Though the site is registered in Antigua and Barbuda, Sports Betting Poker is licensed in the Netherlands Antilles. For all the American poker players searching for a new place to gamble for real money, you could consider this a U.S. poker room, because Sportsbetting accepts USA poker players. Please Note - Sportsbetting.ag accepts ALL USA players! Sportsbetting Poker is a new US poker site, but operates with the well known sportsbook - Sportsbetting.! Since 1991, the "ag" in Sportsbetting.ag stands for Antigua, so it's a site based out of Antigua and Barbuda. That's an important distinction for United States poker players, because these tiny islands in the Caribbean Sea are among the most vocal critics of the UIGEA law. Antigua & Barbuda took the United States government before the World Trade Organization and won a court case. The WTO court said the USA was in violation of international law because of the way it forced its legal system on other states. The American government chose to ignore this ruling, but Antigua and Barbuda continues to be a haven for poker sites which accept players from the United States. Click here to join Sportsbetting Poker and qualify for a 25% cash bonus up to $900. Example - Deposit $100 and receive an additional $25 in cash! The distinction means that while Sportbetting Poker isn't a US poker site, it accept American players and is likely to continue this policy for years to come. Having a continuous policy is important, because US poker rooms which might have their domain seized and player funds frozen at any time make for an unstable playing environment. Sportsbetting.ag isn't one of those card rooms. When you get on Sportsbetting.ag's poker page, go to the "Tournament Info" link to find out the inside information on events at the site. This key gives you everything you need to know for the four basic event types: freezeout, turbo, re-buy, or freeroll. Whichever type of tournament you want to play in, players can learn about the default blind levels, whether re-buys are allowed, how much a re-buy costs, whether an add-on rule applies, and how much you'll have to spend for add-ons. You'll also learn whether a tourney has a dynamic payout structure, what the starting amount of chips are, and how often the blind levels increase. Special terms may apply for one-of-a-kind events, but this gives you a general idea of what to expect. Once you know the basics, click on "Today's Tournaments" or "On-the-Hour Freerolls" to find out specific tournament info. This include the eastern standard time the event takes place, what type of event it is, the max entries, the buy-in (if applicable), and the percentage of players who are paid. 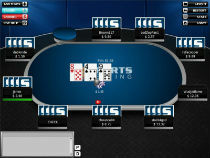 Sportsbetting Poker offers $150K Guaranteed poker tournaments several time throughout the month. Since most online poker events base their prize pot on the number of entrants, having a guaranteed prize pool means you don't have to worry about a sudden lull in signups. No matter what happens when you log on Sunday, players know they'll be competing for $150,000 in prizes at a minimum. Having these big events tells you another thing about a poker site. This is a place which draws in a large number of players and is confident in the size of their player pool. The more gamblers who play at a given site, the more tournaments and cash rooms happen. Having a bigger community means you'll get a wider variety in game selection, bet limits, and other variables. $10,000 guaranteed events are offered even more often. Sportsbetting Poker offers hit-and-run freerolls night and day. The hit-n-run games are turbo events much like sit'n go tournaments. The big difference is these games are free to enter. U.S. poker players searching for freebies should research Sportsbetting Ag's list of hourly freerolls, too. The $500 POP2Cash tournaments are weekly events where American players can turn their POP points into entry fees. The POP points are credits you've earned by entering other events or having a rake taken in a ring game, so it's money already spent. Enter these events for the chance to win from the $500 prize pool, which is one of the best real money deals on the site. Check out the calendar of events for weekly schedules and special events at the Sportsbetting.ag poker room. Because it's part of the Revolution Gaming Network, Sportsbetting.ag Poker has several poker promotions that US players should be familiar with. One of those is the 25% free player bonuses, which is a guarantee for any tournament entry. This includes a bonus for life, along with a special tournament bonus. No bonus codes are required. You'll get these bonuses for entering Texas holdem, Omaha, stud, or draw tournaments. Any sort of poker is rewarded with the same generous promotional rewards.